This past Sunday we reflected on the reality of the burdens in our lives. During the sermon I used a few metaphors to illustrate the burdens we have often taken upon ourselves. You might remember that I talked about how I had been driving around with a load of loose mulch in the back of my truck since Thursday. I went to the county transfer station and loaded a pile of free mulch so that I could spread it on Friday. Low and behold, neither Friday nor Saturday were spent spreading mulch, but rather with family having fun. Truth be told, it didn’t take a lot of cajoling to get me to avoid that mulch mountain. I didn’t just talk about my mulch in an attempt to solicit sympathy or maybe some free help. I really saw that mulch much like many of the burdens that are often in my life. On Thursday afternoon, I had the best of intentions to spread that mulch as soon a possible. Yet, by Sunday I knew it “had to be done.” How often do we find ourselves experiencing this dynamic? We often take up easy and positive things and find that soon a blessing turns into a curse. Fast forward to about three o’clock Sunday afternoon, the mulch once again reminded me of how the world works. I decided that the time to procrastinate was over. Out I went to unload the truck and spread the mulch. I fetched the wheelbarrow and found the tire in the condition I thought it would be; flat, not round, and void of air. I pumped the tire up with a small electric pump and again set my sights on that mulch. Soon enough, a load or two of mulch was unloaded and spread in the flowerbeds. Then I made a realization. The tire that I thought had a slow leak actually had a major leak and was once again quickly going flat. The tool that was intended to make my burden light was failing me. Now here is where the mulch taught me a second lesson on dealing with burdens. It is critical to know that there is help on your side. I had made my mind up that I was going to get that mulch out of the truck bed. The burden needed to be lifted. I then made a request of a friend for help. He soon produced a wheelbarrow for me to borrow and back to work I went. No, he didn’t volunteer to help with the work, but he was ready and willing to equip me to do it. Isn’t this really the way that God works in our lives every day? The burdens, both externally imposed and self-imposed, in our lives frequently seem insurmountable. It is often the case that when we finally decide to shed the burdens, we need God’s help. Even when we think we are ready and equipped to do it on our own, we need an assist. Christ reminds us that he is ready to share the burden and yoke up with us to carry the weight and train us to do the work. Who knew that free mulch from the dump was so full of spiritual messages? What burdens to you need to seek help from God in Christ to carry? Are there burdens that just need to be laid down? 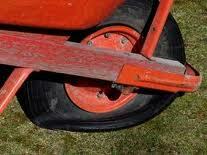 Do you have a Spiritual friend who can lend you a wheelbarrow when yours goes flat?